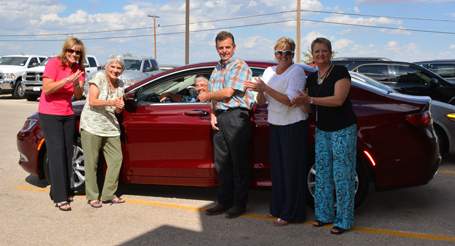 Altrusa Club of Artesia members, from left, Leah Boone, Sue Pemberton, Connie McIntire, Paula Menefee and LuAnn Beardemphl pose with Tate Branch of Tate Branch Dodge as they imagine the thrill of winning the keys to a new Chrysler 200G, the hole-in-one prize on offer at Altrusa’s 14th annual golf scramble, set for 9 a.m. Saturday, Oct. 3, at the Artesia Country Club. Entry is $30 plus cart and greens fees. Tee-box sponsorships are also available at Eagle ($200), Birdie ($100) and Par ($50) levels. Proceeds from the event help “Give Our Leaders a Future (GOLF)” by benefitting Altrusa’s academic scholarships for graduating Artesia High School students. To register for the all-ages scramble, call the Pro Shop at 746-6732. Sponsorships and donations may be mailed to: Altrusa Club of Artesia, P.O. Box 652, Artesia, N.M., 88211-0652.